Dickson caught four of five targets for 42 yards in Saturday's wild-card loss to the Cowboys. Dickson didn't receive a target but rushed once for nine yards in Sunday's win over the Cardinals. Analysis: Dickson logged a carry on the Seahawks' first offensive drive but only had run-blocking contributions after that. 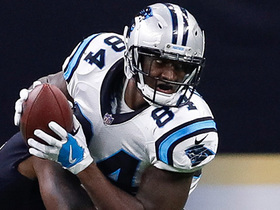 After missing the first six games of the regular season, Dickson has made little effect on the offense with just 12 catches in 10 games, although he hauled in three scores in that span. Dickson will work as the second tight end for Saturday's opening playoff game versus the Cowboys. Dickson hauled in his only target for four yards in Monday's win over the Vikings. Analysis: Dickson has totaled just 17 yards over the last three games and needs touchdowns for any relevance. After receiving three red-zone targets in his first four weeks back from a quadriceps injury, Dickson hasn't recorded one since. Relying on Dickson in the fantasy playoffs would be unwise. Dickson didn't receive a target in Sunday's win over the 49ers. Analysis: Dickson didn't seen more than two targets in his first five games back from a quadriceps injury, so this slip in the stat line isn't surprising. He'll square up against a tough Vikings defense, which has allowed just three touchdowns to tight ends, in Week 14. Dickson hauled in both targets for 13 yards in Sunday's win over the Panthers. Analysis: Dickson was held under 15 receiving yards for the second straight game, this time by the team he spent the previous four seasons with. The veteran tight end has just seven targets in five games since returning from a quadriceps injury, so his fantasy value is minimal. 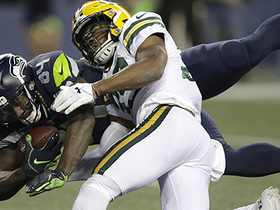 Dickson's only target Thursday night against the Packers resulted in a 15-yard game-winning TD in his team's 27-24 victory. Analysis: Since his return from a quad injury, Dickson has totaled five targets in four games, en route to hauling in four catches for 93 yards. While two of those catches have gone for touchdowns, his low volume makes him a hit-or-miss fantasy play, especially while sharing tight end work with Nick Vannett, who out-snapped Dickson by a 42-30 count Thursday. Dickson caught his only target for 24 yards in Sunday's 36-31 loss to the Rams. Analysis: Since returning from the NFI list in Week 8, Dickson has been targeted just four times in three games, but two of those came in the red zone. He's not a dependable fantasy option at this time, especially in Week 11 against the Packers, who haven't allowed a touchdown to a tight end this year. Dickson brought in both of his targets for 54 yards and a touchdown in Sunday's 28-14 win over the Lions. Analysis: It was a nice debut for Dickson, who missed the previous six games while on the reserve/non-football injury list. He made an excellent 12-yard touchdown catch in the second quarter and snagged a 42-yarder in the third frame. Starting tight end Nick Vannett was targeted more (three), but Dickson could take over the top spot with a few more solid outings. Dickson (quadriceps) will play Sunday versus the Lions, John Boyle of the Seahawks' official site reports. Analysis: Dickson has played second fiddle in Carolina the last four years, and he signed with the Seahawks in the offseason in hopes of making a heightened impact. With rookie tight end Will Dissly (kneecap) out for the season, Dickson will split time with Nick Vannett. The volume isn't guaranteed for Dickson, so he's likely a touchdown-dependent fantasy option. In his eight-year career, Dickson has just one season with more than two touchdowns. Dickson (quadriceps) was activated off the reserve/non-football injury list Saturday, Curtis Crabtree of Sports Radio 950 KJR Seattle reports. Analysis: Dickson was a full practice participant Thursday and Friday, clearing the way for his return against the Lions on Sunday. 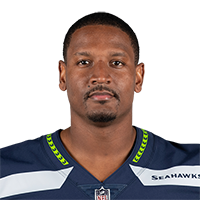 The 31-year-old could provide an immediate boost to the Seahawks' passing game that has been searching for answers at tight end since Will Dissly was lost for the season due to a knee injury. Dickson (quadriceps) doesn't have an injury designation for Sunday's game at Detroit, John Boyle of the Seahawks' official site reports. Dickson (quadriceps) was a full participant in practice Thursday, John Boyle of the Seahawks' official site reports. Dickson (quadriceps) was a limited practice participant Wednesday, John Boyle of the Seahawks' official site reports. Dickson (quadriceps) returned to practice Monday, Bob Condotta of The Seattle Times reports. Analysis: With Dickson back on the practice field, the Seahawks can activate him to the 53-man roster at any point. Depending on how his quad holds up in practice this week, he may make an appearance in Sunday's game in Detroit. Dickson's services would be welcome, especially if tight end Nick Vannett's back injury is still a bother. Coach Pete Carroll said Dickson (quadriceps) has "a chance" to make his season debut Week 8 in Detroit, Brady Henderson of ESPN.com reports. Dickson (quadriceps, groin) remains on track to return Week 7 when he's first eligible to be removed from the non-football injury list, John Boyle of the Seahawks' official site reports. Analysis: Will Dissly (knee) is expected to miss the rest of the season, leaving Nick Vannett as the only healthy tight end on Seattle's 53-man roster. The team surely will add another body in the meantime, but the situation bodes well for Dickson to eventually earn a sizable role. Vannett has caught nine of 14 targets for 67 yards in four games, displaying minimal upside in the passing game. Dickson (quadriceps, groin) is expected to return Week 7 after his six-week stint on the non-football injury list is completed, Bob Condotta of The Seattle Times reports. Analysis: Dickson has yet to play a snap for the Seahawks in an exhibition or regular-season game. In Dickson's absence, quarterback Russell Wilson has turned to rookie Will Dissly, who has a 7-151-2 line through three games, and Nick Vannett. When Dickson returns, he shouldn't be scooped up in fantasy settings, as the ninth-year pro has just six touchdowns over the last six seasons. The Seahawks' decision to keep Dickson (quadriceps, groin) on the non-football injury list will require him to miss at least the team's first six games, ESPN's Brady Henderson reports. 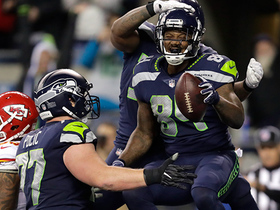 Analysis: After signing a three-year deal with Seattle worth $10.7 million, Dickson was viewed as the team's presumed starting tight end. In his absence, however, Nick Vannett is in line to serve as the team's No. 1 option at the position, with fourth-rounder Will Dissly also expected to factor in out of the gate. The Seahawks are placing Dickson (quadriceps, groin) on the reserve/non-football injury list, Gregg Bell of The Tacoma News Tribune reports. Analysis: Coach Pete Carroll recently revealed that Dickson suffered a setback in his rehabilitation from groin and quadriceps injuries that forced him to the NFI list to kick off training camp. No matter how long his recovery lasts, the Seahawks are entering the season with Nick Vannett at the top of the tight end depth chart. Coach Pete Carroll acknowledged Wednesday that Dickson (quad/groin) has dealt with a setback during his rehab process, the Seahawks' official website reports. "(Dickson) had an issue coming back where something else got aggravated, so it exacerbated the problem of just returning where he can get in shape and all that," Carroll said. "We'll go at it, really a couple days at a time here to see how he does." Analysis: This may explain why Dickson's injury has been reported as both a quad and groin issue. 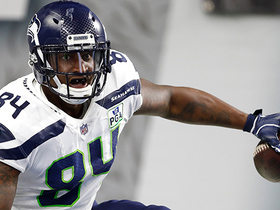 Whatever the case, the 31-year-old tight end has been on the non-football injury list since the beginning of training camp while Nick Vannett has operated as Seattle's top tight end. Dickson doesn't seem to have much shot at being ready for Week 1, and he may only be second on the depth chart whenever he's available to play. Coach Pete Carroll declined to comment on Dickson (quad) when asked about the tight end during Monday's media session, Bob Condotta of The Seattle Times reports. Analysis: Signed to a three-year, $10.7 million contract in March, the 31-year-old tight end hasn't practiced since the offseason program. Carroll said last week that Dickson still had a shot to be ready for Week 1, but it becomes less and less likely with each passing day. Nick Vannett figures to enter the season as Seattle's top tight end, with fourth-round rookie Will Dissly potentially handling the No. 2 role. Dickson (quad) still has a shot to be ready for Week 1 against the Broncos, Bob Condotta of The Seattle Times reports. Analysis: Following last week's comment that Dickson wasn't making much progress, coach Pete Carroll sounded a bit more optimistic Tuesday, saying he's still hopeful of having the veteran tight end ready for Week 1. With Dickson on the non-football injury list for all of training camp, Nick Vannett has gone unchallenged as the Seahawks' top tight end. Dickson may end up with the No. 2 spot on the depth chart even if he does make it back at some point in September. Seahawks coach Pete Carroll said Dickson isn't making much progress in his recovery from a quadriceps injury, Gregg Bell of The Tacoma News Tribune reports. Dickson (groin) will be placed on the Non-Football Injury list for the beginning of training camp, Derek Lewis of 247 Sports reports. Analysis: After initially being reported that Dickson would miss time to start camp, it's now clear that Dickson's injury is significant enough to warrant him being kept off the 90-man roster for the time being. The setback will mean the potential Week 1 starter doesn't have a chance to solidify a role for himself early on, opening the door for Nick Vannett or Will Dissly to work their way up the depth chart the next couple weeks. Dickson will miss some time during training camp due to a groin injury, Curtis Crabtree of Sports Radio 950 KJR Seattle reports. Analysis: Dickson projects to be one of the Seahawks' top tight ends in 2018, but he'll miss some valuable time in what is his first training camp with the team. It doesn't appear as though he'll miss significant time with the injury, but he currently is without a concrete return timetable. Dickson is joining the Seahawks on a three-year contract that has a maximum value of $14 million, Ian Rapoport of NFL Network reports. Dickson finished with 30 receptions (on 47 targets) for 437 yards and a touchdown in 16 games played this season. Dickson will settle back into a reserve role at tight end Sunday against the Vikings with Greg Olsen (foot) cleared to return to the lineup, Jared Allen of the Panthers' official site reports. Dickson caught both his targets for 18 yards in Sunday's 31-21 loss to the Saints. Analysis: Dickson got the start at tight end with Greg Olsen (foot) back on the sideline, but the veteran couldn't get much going. Although he hauled in the only two looks that went his way, Dickson hasn't topped 40 yards since his Week 5 outburst and will be even less likely to do so once Olsen is consistently available again. Dickson is expected to start in place of the inactive Greg Olsen (foot) on Sunday at New Orleans. Analysis: In nine starts during Olsen's time on injured reserve, Dickson caught at least three passes six times, surpassed 30 yards on four occasions and scored one touchdown. While not overly impressive, Dickson could be a decent fill-in versus a Saints defense that has given up three tight-end TDs over the last four games. Dickson is expected to serve as the Panthers' starting tight end Sunday against the Saints with Greg Olsen (foot), who is listed as questionable for the contest, appearing unlikely to play, Ian Rapoport of NFL Network reports. 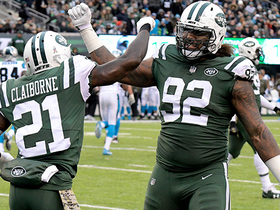 Dickson caught one of three targets for 15 yards in Sunday's 35-27 win over the Jets. Analysis: Dickson's reception saw him top Greg Olsen's one for 10 yards, and although Olsen was forced to withdraw early from his return from a foot injury, if Carolina's top tight end is able to shake off the rust, Dickson figures to slide down the pecking order in the coming weeks. Dickson is expected to notice a reduced role in Sunday's game against the Jets with fellow tight end Greg Olsen (foot) on track to return from injured reserve, Brian Costello of the New York Post reports. Dickson nabbed three of five targets for 33 yards and a touchdown in Monday's 45-21 win over Miami. Analysis: Dickson leaped for a seven-yard touchdown reception on a quick slant just before the half during Monday's game, his first score of the season. Week 5's explosion against Detroit aside, Dickson has been solid but unspectacular this season as he has seen an uptick in usage with Greg Olsen (foot) on the shelf. Those opportunities seem to be coming to an end with Olsen reportedly expected back for Week 12's game against the Jets. Dickson failed to haul in either of his two targets in Sunday's 20-17 win over the Falcons. Analysis: Dickson was part of an offense that only passed for 137 yards, which was distributed between three pass-catchers. With Dickson not being one of those, his streak of five straight games with at least three receptions was snapped. The veteran will look to bounce back next Monday night against the Dolphins. Seattle Seahawks tight end Ed Dickson finds space in the back of the end zone for big fourth-quarter touchdown. Seattle Seahawks quarterback Russell Wilson has ALL DAY on third-and-long connection to tight end Ed Dickson. 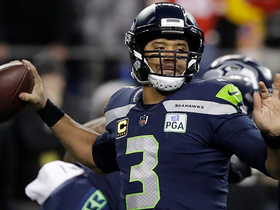 Seattle Seahawks quarterback Russell Wilson throws a quick strike to Ed Dickson in the left seam for a go-ahead touchdown that proved to be the game winner against the Packers in Week 11 of the 2018 NFL season on "Thursday Night Football." 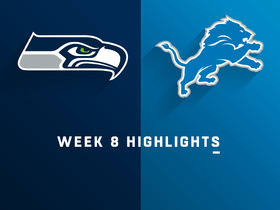 Watch the highlights as the Seattle Seahawks travel to take on the Detroit Lions in Week 8 action. Seattle Seahawks quarterback Russell Wilson throws a 12-yard touchdown pass to tight end Ed Dickson. 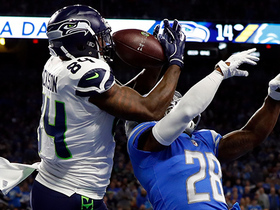 Seattle Seahawks quarterback Russell Wilson finds tight end Ed Dickson completely unmarked to receive the ball and gain 42 yards before tackled by Detroit Lions defensive back Quandre Diggs. NFL Network's Mike Garafolo and Ian Rapoport report that the Seattle Seahawks have signed free agent tight end Ed Dickson. 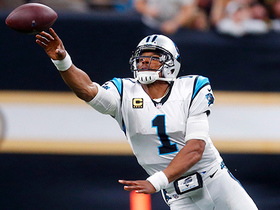 Carolina Panthers quarterback Cam Newton tosses to wide receiver Ed Dickson for a 6-yard gain. New York Jets cornerback Morris Claiborne takes down Panthers tight end Ed Dickson just inches shy of the end zone to keep the Panthers from scoring on the 2-point conversion attempt. 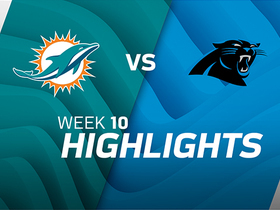 Check out the highlights from the Week 10 matchup between the Miami Dolphins and the Carolina Panthers.